Google Maps is fast becoming the go-to cartographic representation of the world for a significant proportion of its population. Locate street? Google Maps. Directions for driving? Google Maps. Create link for website? Google Maps. It's an amazing tool, not least the ability to see zoom down in satellite mode, switch to Street View or check out your nearest restaurants. How quickly we've learned to take it for granted. There is of course a reason why Google Maps is free, and that's because we're the market. Only certain businesses appear on the map, often vastly out of proportion to local importance. Every time we use or click on the map Google adds yet more data to the stash of information it knows about us. Unmonetisable uses, like walking, are not catered for. Your house is now visible to everyone whether you like it or not. Maybe that's why Google Maps is not my go-to choice. Here are my three digital favourites. 1) Streetmap: Yes, I know it's old-fashioned (and ad-heavy if your blockers are off), but this wins for me because it's based on Ordnance Survey mapping. You can't beat intelligent long-established cartography, not least for contours, rivers and boundaries, and Streetmap allows me to scroll without limits round a giant scaleable OS map. Also I've been using it on this blog for 15 years and the original hyperlinks still work, so that's a win. 2) OpenStreetMap: I'm amazed this collaborative mapping platform isn't more widely used. Compiled by volunteers, hence copyright free, OSM has grown since 2004 into a massively detailed representation of the world around us. It's clean, clear and definitive, and is particularly brilliant at showing footpaths (Google can't be arsed with pedestrians, and OS maps only show rights of way). 3) Guru Maps: The official smartphone version of OpenStreetMap is Maps.me, but I went off that when it updated and I switched to Galileo, now known as Guru Maps. This is an offline map for iOS or Android, vector mapped so that the UK comes in at 214MB, which means I can always fire up a decent local picture wherever I am. It's helped me find that footpath shortcut from A to B innumerable times, enabling many of this blog's more intriguing explorations. Don't waste your time on the paid-for 'Pro' version unless search is important to you. 5) Online, everyone seems to like like OpenStreetMap (and its variants), but there's also Bing Maps (which is OS if you zoom in far enough) and Michelin. 6) App-wise, you've suggested OsmAnd (OSM for ioS and Android), Maps (on the F-Droid platform for Android) and BackCountry Navigator (for Android), or perhaps a £19.99 Ordnance Survey annual subscription. 7) Historically, I wouldn't be without the old map repository from the National Library of Scotland, and you also like SABRE Maps. I'll pause here, should anyone want to discuss the pros and cons of Google Maps and its competitors, before continuing with what today's post is really about. Five years ago Google Maps thought Basingstoke was called Town Centre and was convinced Cazenove was one of London's most important suburbs. These days it's more geographically accurate, but also intriguingly sparse. As you zoom in, a lot of the map is roads and empty space, and only gradually do actual place names appear. Stratford first appears at level 11, surrounded by nowhere much. Here it is at level 13, equally bereft. Obviously the mostly-blank background is ideal for plonking all those pins and businesses that Google Maps loves so much. But what intrigues me most is where the word Stratford has been positioned. It's not in the traditional town centre, nor in the modern commercial focus around Westfield (both of which appear as shaded areas to the south). Instead it's been plonked beyond the Olympic Village, halfway to Leyton, in the middle of an oddly peripheral residential district. Zoom closer and you can see STRATFORD is centred where Major Road meets Chandos Road, so I've been along to check whether Google might have a point. Major Road isn't an especially major road, not since the A12 dual carriageway swept most of the traffic away. It's part of a strange loop on the road towards Leyton, surrounding a patch of land Google Maps thinks is called Major Road Open Space, but which hasn't been open for the last ten years. The Travellers site formerly at Clays Lane was relocated here when the Olympics required its demolition, so one side of the road is now a walled corral of trim permanent caravans. In one corner of this plot is Major Road Baptist Church, emblazoned with times of services and declaring "We Are All Precious In..." Heaven-Knows-What, on a part-ripped peeling poster drooping off a board out front. 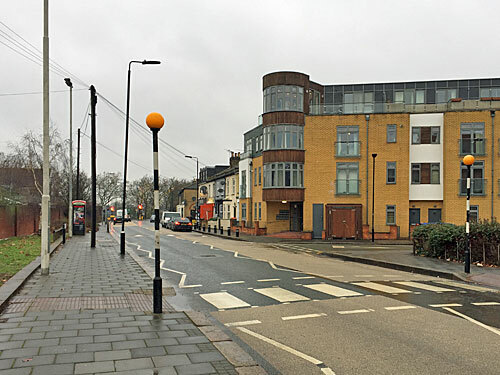 A sequence of unremarkable flats flank the opposite side of the road, the more modern edifice on the corner with Chandos Road taking the name Metro. If you were ever looking for the Leyton House Working Men's Club & Institute, it lingers here. Only a short section of original terrace remains, built in the late 19th century when this was Stratford Newtown, a moniker irrevocably lost. It's here we find the only shops in what Google Maps thinks is the centre of Stratford, one a solicitors and the other an off licence called Major Express for all your fruit, lottery and Oyster needs. Don't rush. Most bafflingly the borough of Waltham Forest begins at the end of the road, less than 100 metres distant, meaning this very nearly isn't Stratford at all. Google Maps labels most other London suburbs rationally - even LONDON itself zooms in on the Charles I statue in Trafalgar Square. But Stratford appears to be a misstep, a wildly misplaced label, on the digital map you still can't quite trust to get its geography right.